Most people know nettle by its lasting sting. One accidental brush against its bristly lines of hair causes burning, numbness and swelling for hours. The defending chemicals that cause the trouble are water soluble so nettle is safe to eat after drying, freezing or heating. Nettle has a good reason to defend itself; it is an invaluable food source and potent medicine for many ailments. Nettle offers a bounty of benefits to those who stock it in either their kitchen cupboards or medicine cabinets. Nettle’s spiny leaves are unique in their balance of protein, vitamins and minerals. The balance of nutrition in nettle is well suited for the human body. It is however, higher in iron than the minimum RDA for daily consumption. This high iron content is what makes nettle ideally suited for people with challenges to their immune system and low energy. Nettle is appropriate to use to prevent infection and recover from infection, but since bacteria needs iron to spread, it is best to stay away from iron rich food until the infection recedes. As a diuretic, nettle is a handy herb for people who often struggle with urinary tract infections. It’s often combined with dandelion leaf, corn silk, parsley or chickweed. Any herbal treatment of PMS or swollen ankles wouldn’t be complete without a dose of nettle. Stinging nettle is a blessing for any one who suffers from allergies. Its secret lies in the nutritional boost it gives the body as well as the anti-inflammatory action of its leaf. 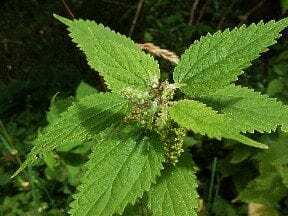 Nettle is usually thought of as relief for pollen allergies but recent studies have concluded patients with skin conditions such as eczema and hives benefit as well. Nettle root increases the production of T cells, which is vital to controlling allergic reactions. A dose of nettle before meals can help people with mild to moderate food allergies. Nettle’s nutritional balance is practicularly helpful for those suffering from anemia. Nettle has vast amounts of iron, chlorophyll and vitamin C, which increase the body’s red blood cell count. Regular blood donors recover quicker after adding nettle to their diet. It’s excellent for people who have trouble absorbing nutrition from their food properly. Nettle is also a great herb for nursing mothers. Nettle root is specifically being studied for its healing effect on Benign Prostatic Hypertophy (BPH). The extract decreases the rate of growth significantly. The root tincture is best to use with guidance from a qualified health care specialist in treatment of this disease. The anti-inflammatory action of nettle means diseases like arthritis can be successfully treated as well. Many herbalists combine nettle with turmeric or ginger to reduce the swelling that causes arthritic pain. Diuretic, astringent, anti-inflammatory, nutrative, alterative and tonic. Nettle leaf is an easy herb to preserve. It quickly transfers its qualities to vodka, brandy or other 100 proof alcohol. The ideal strength is 1:1 for this plant. The tincture is best when made from fresh nettle but in a pinch, dry leaf will be fine as a substitute. The root or seed are best used as a tincture with half the alcohol content the leaf requires. Nettle leaf also makes a tasty vinegar when added to apple cider vinegar and strained after a few weeks. It’s a blessing to drink nettle tea during allergy season. Simply add the leaf to your favorite green or black tea blend as part of your morning ritual. Since these teas block iron in the body, adding nettle counteracts this problem. Your sinuses will thank you. Nettles grow in moist, heavy soil. Even the soggiest clay soil is no problem for nettle. Nettle is often used as easily grown green manure or nutritious fertilizer for other plants due to its high mineral content. Nettle grows in my rain garden at home. It’s inspired by the vast amounts of rain in our region and happily conditions the soil and keeps the extra rain from flooding my patio. With this plant growing out my back door, I can gather the nettle as I need it. Harvest nettle leaves in spring before flowering. After flowering, the leaves are too saturated with silica to make them digestible. Several harvests can be made in one patch every year as the plant regrows after pruning. Nettle is usually kind enough to grow amid plants that provide relief for its sting. Plantain, lemon balm and dock are excellent for reducing inflammation from nettle burns. Simply crush the leaf of any of these plants between your fingers or chew it into a poultice and apply it directly to the stung area. I prefer to collect nettle using a large, open basket or brown paper grocery bag, rubber kitchen gloves and kitchen shears. 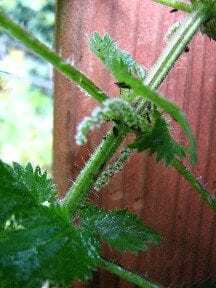 If I play my cards right, I can snip the nettle stalk just above the first or second ring of basal leaves and it will fall into the basket without any further assistance. Once I have the amount I need, I take my precious cargo home, wash it and start cooking. Some nettle is hung from strings to dry and some is frozen for later. In a few weeks, I run out and start the process all over again. Nettle roots may be harvested in the fall at the same time as nettle seed is harvested. Nettles develop a vast network of roots that bring nutrition to the soil and break up clay. It can take over areas with dense soil within a few seasons. It’s a good choice for rain gardens in areas with limited access to the public. Nettle is easy to identify. 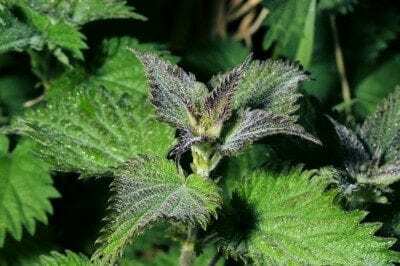 It can grow nearby a similar-looking skullcap relative but nettle has a clean, chlorophyllic scent when fresh and its stinging hairs are a dead give away. Appearance: Dark green serrated, alternate leaves often have hints of purple along the deep vein lines, stalks are fiberousand lined with stinging hairs that also run under the leaves. Flowers are inconspicuous blooms that develop into a small spray of tiny round seeds. Just as for humans, nettle provides our canine friends a wonderful set of nutrients. Dried nettle or nettle infusion added to your dog’s meal will aid in digestion and general health while providing an extra boost of calcium that’s much needed both in puppy-hood and in your companion’s elder years. Ducks and chickens can benefit from a ration of dried nettle leaf added to their meal as well, especially during laying season. Nettle provides domestic ducks who consume feed formulated for chickens a boost in niacin, which is a vital nutrient needed in slightly higher portions for ducks than for chickens. Both nettle and comfrey were old-fashioned dried greens to add to livestock food because they held their nutritional value for so long. Nettle leaf has a long history of culinary use. It can be used in any recipe where cooked greens are requested with ease. Almost any recipe with cooked spinach can be made more nutritious by substituting nettle pound for pound. Nettle is great in soups, stews and stir fries when other greens are still trying to shake off winter. Nettle leaf is a traditional hair tonic used to fortify thinning or damaged hair. Mineral rich nettle vinegar is diluted with water for a hair rinse. For Native Americans of the Pacific Northwest, nettle was also valued as a shampoo. Nettle is a wonderful addition to compost piles. Its nutritional properties easily integrate into the soil for a vitamin and mineral rich boost. The same idea is extended to direct applications for either indoor or garden plants. Nettle is traditionally combined with comfrey to make organic fertilizer. Nettle stem contains rugged fiber that has been woven into clothes or baskets by traditional cultures the world round. These fibers are durable, thin and flexible. The fiber is collected from the stalks when nettle is finished producing seed. Rub the stalks together briskly to break the fibers from the stem. The fibers will separate easily in your hands. For more recipes and ideas for using Nettle, see The Practical Herbalist Recipes. Touching the spines of fresh nettle will cause temporary dermatitis. Although it is rare, some people have reported allergies to cooked nettle. Nettle may interact with sedatives or prescription medication for diabetes or high blood pressure. Do not take nettle as a supplement during a bacterial infection. See Medicinal Properties and Actions section above. For more information see our History, Folklore, Myth and Magic page on Nettle.